The phone call that changed our lives came in December of 2007. It was from a social worker in Alaska. 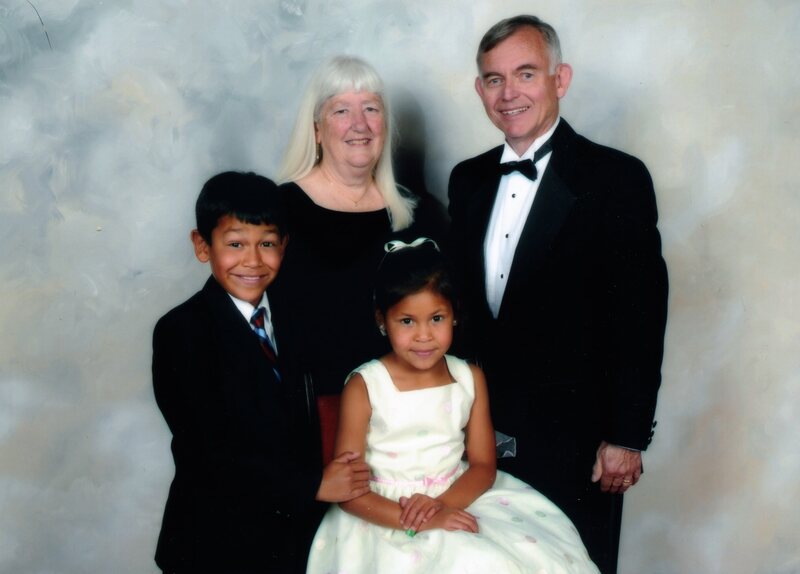 I remember some of the things she said– “…two children ages 5 and 2” “…have been in foster care for a year” “…Judge wants them placed with family,” and “Can you take them?” I told the worker that we were too old, we were planning to retire and it wouldn’t be possible. Then we got to thinking. We like being with children, we certainly have had experience, we were in good health and active, and the idea of children being left in a foster home was disturbing. So, we kept talking about it. We knew very little about the children. A girl nearly 3 and a boy 5. We decided to ask for more information and in March 2008 we went to meet them. 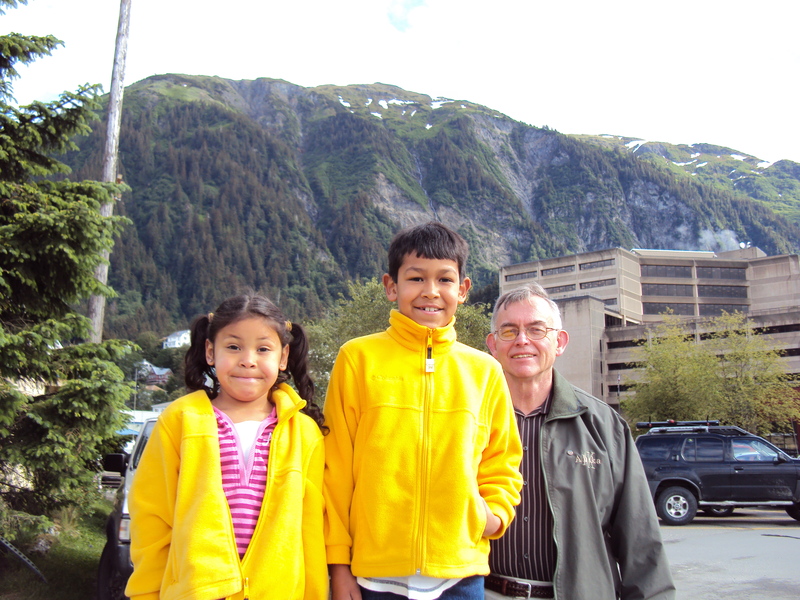 W spent several days with them in a hotel, exploring Fairbanks with them, and talking with foster parents, therapist, and teachers. The kids were great, they had issues, they a traumatic early life, but we didn’t learn anything that we found too frightening. We decided to start paperwork which took several months. 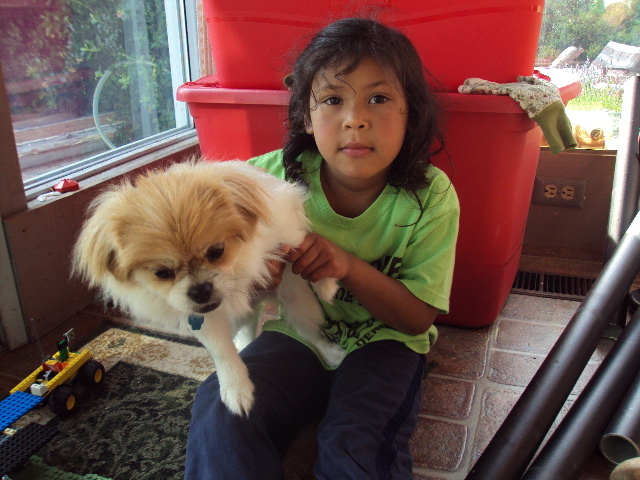 There were more visits with the children and finally during the summer five years ago, Seneca and Raven joined our family. strong-willed, wanted to be in charge, and had a temper. We quickly learned to avoid all but the most important issues with her. 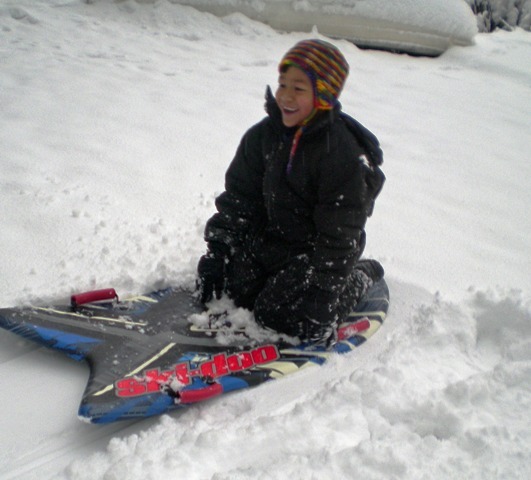 Raven had a great smile, he was well coordinated and active. He was loving and made friends easily. He was wary and cautious. He loved the outdoors, climbing trees and playing at the beach. 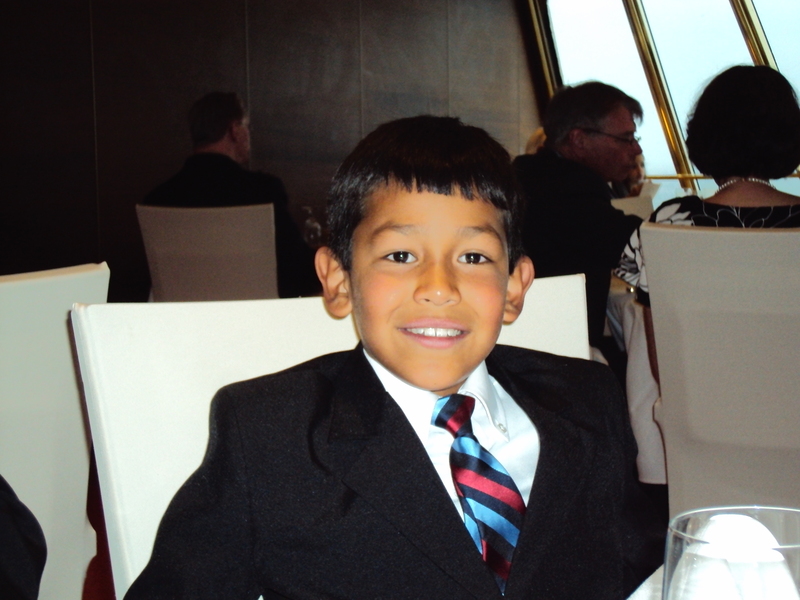 He was a quiet boy when he came but soon turned into a chatterbox. I asked him about why he suddenly was talking so much and he responded, “Before nobody ever listened.” We were happy to be there to listen. Ted and I kept grinning at each other, so far so good! 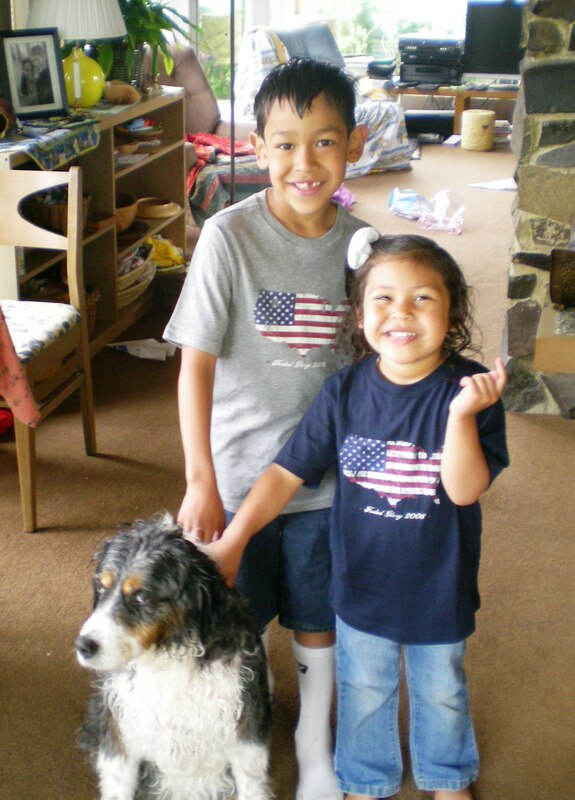 The summer went by quickly and Raven started first grade at Dry Creek School. Seneca started at the Lower Elwha Klallam Head Start, and we were able to make some connections with the Tribal community. The kids gradually learned our family way of doing things, table manners, how to behave in church, how to take care of their toys and pets. 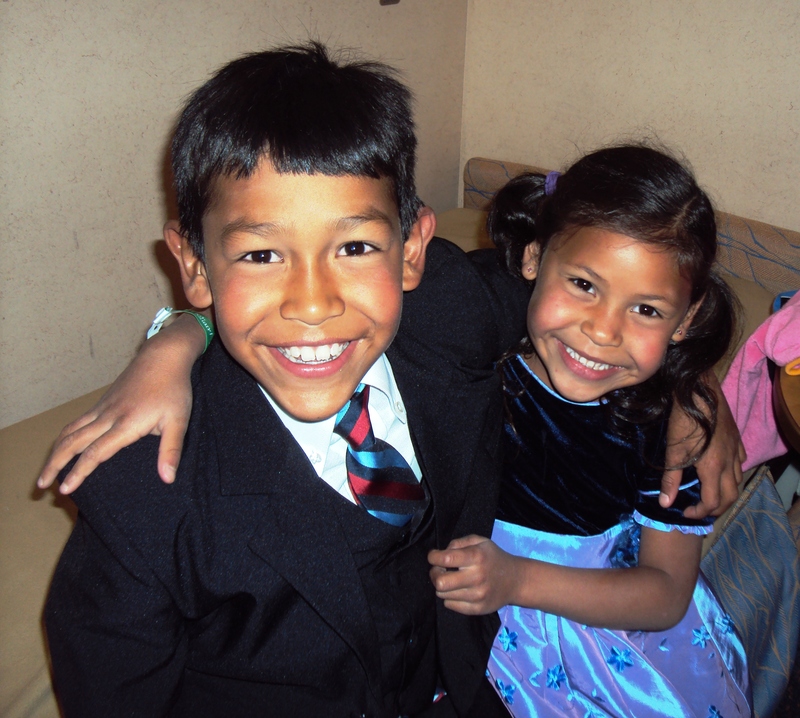 They talked less and less about their foster family in Fairbanks. We have had many adventures together, a cruise to Australia, camping in our motor home, several trips to Juneau where they were born and where Raven started kindergarten. We located relatives there which eventually lead us to the island town of Hoonah, population 600, where we met their great, great grandparents and the grandmother, a tribal elder gave them Tlingit names. We have visited Ripley relatives in Maine and Utah and Arizona. 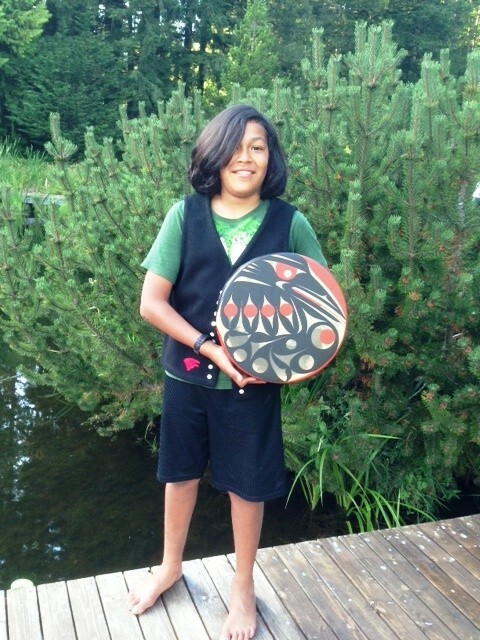 This summer a much more mature Raven attended a summer camp with local Klallam kids. Seneca will attend a science camp sponsored by the Dungeness River Audubon Society. 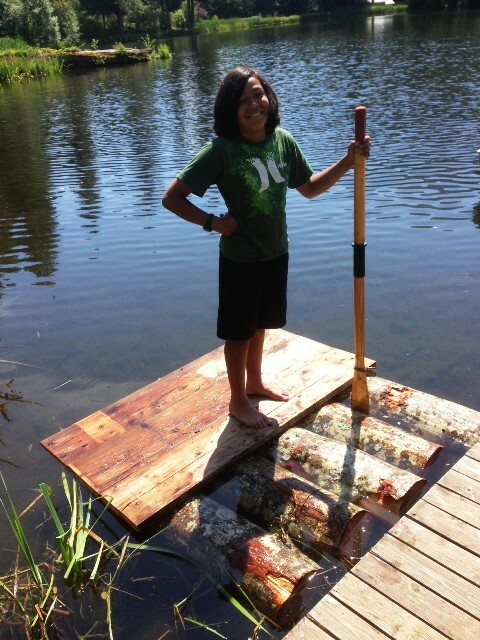 They are building a tree house, love to paddle around Lake Dawn in our small row-boat, and a few days ago Ted and Raven built a raft to float on the lake. Seneca enjoys her dolls and develops long. 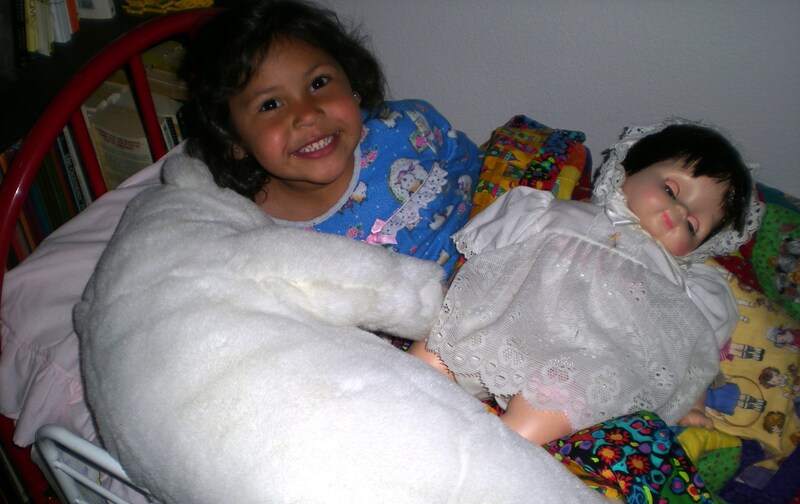 involved stories with them using her doll house and other props. Sometimes Raven can be convinced to join in. Having the kids has changed our lives. Ted has continued working as he enjoys his law practice and kids are expensive! Our social lives have been affected as none of our friends have small children.. We don’t have time to do all of the things we want to do, but I do find time for quilting and for dolls. And it is fun sharing our lives with kids. This weekend we are camping at an incredibly beautiful campground only 45 minutes from our home. We had been here but never stayed. The kids are playing in the river making dams and building campfires at night. 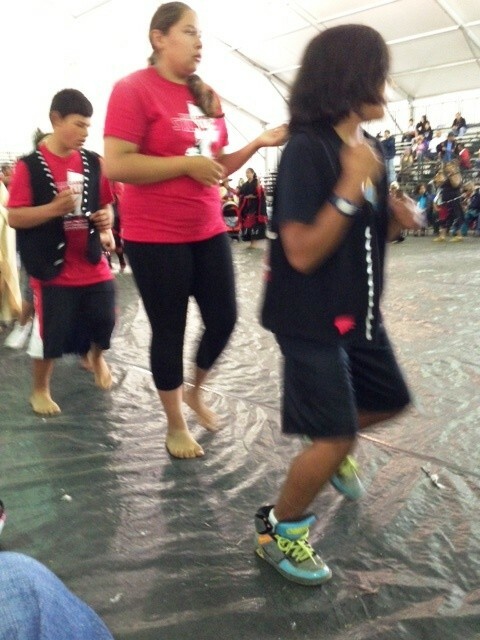 Yesterday we drove an hour to Neah Bay where the Makah Days Celebration was going on. We watched the parade and the kids each collected a sack full of candy as it was thrown by passing parade participants. We all had a great time. Sometimes I wonder what our lives would have been like without them. 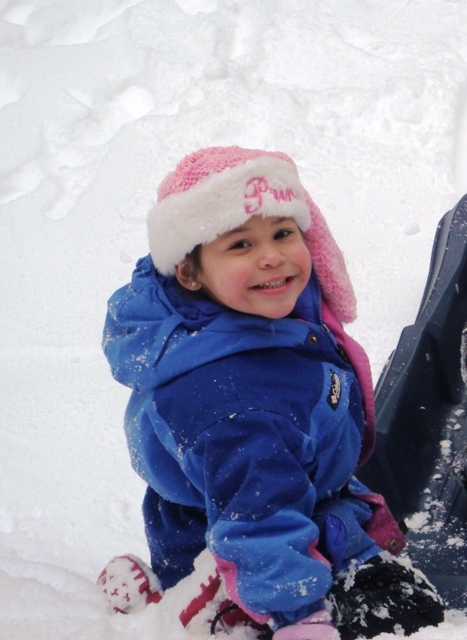 But we treasure the kids and mostly are very happy that we have them in our lives. 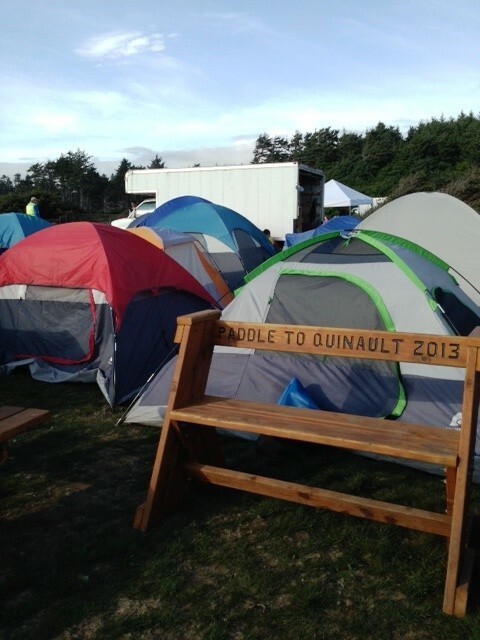 We arrived at the Quinault Nation, the location of this year’s Tribal Journey celebration, expecting to spend a long day. At one time a Coast Guard base had been located on this point, but no facilities remained. Activates were held in a huge tent. 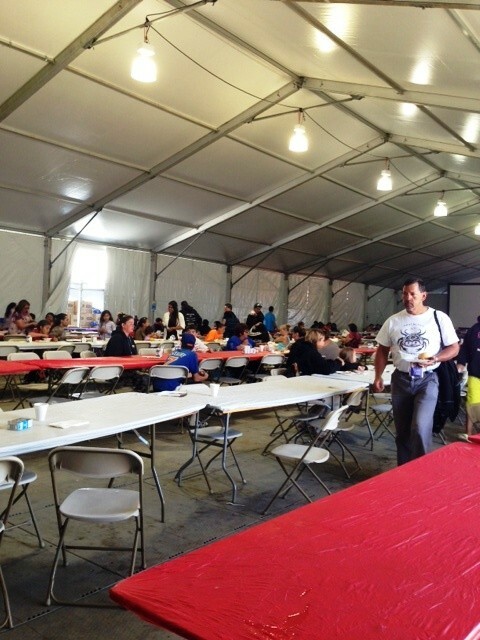 Meals, for the estimated 15,000 attendees were served in a separate tent and cooking was done outside using portable kitchens. Huge generator trucks provided electricity and water was also trucked in. 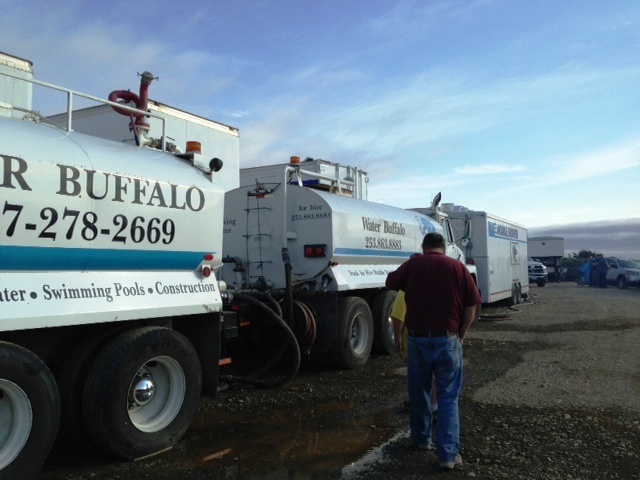 Portable showers, washing machines, and hundreds of portable toilets were also on site. A special wi-fi system had been created so it was easy to be “connected” with the outside world, and there was even a tent where electronic devices could be recharged. 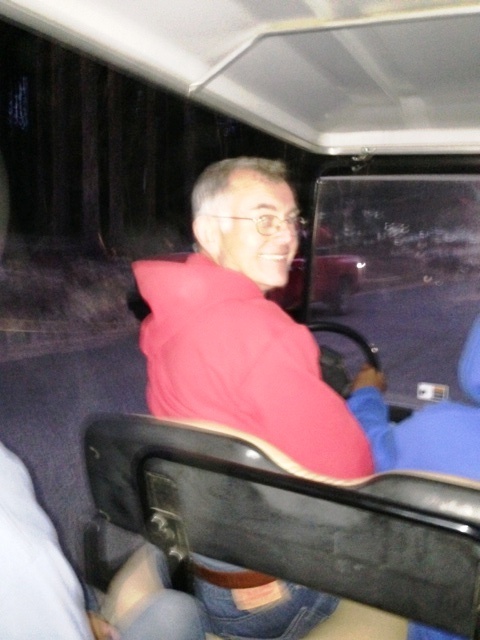 A new road had been cut through and golf cart type vehicles moved people from the parking lots down to the site, which was on a cliff overlooking the beach where canoes had landed. Views of the Pacific Ocean were stunning, even to those who have lived their lives in this area. Most canoe “pullers” and their families and support people stayed in small camping tents. The planning and attention to detail were amazing. All participants were fed and fed well. Watching the activities we could hardly go an hour without being offered water or a sandwich. 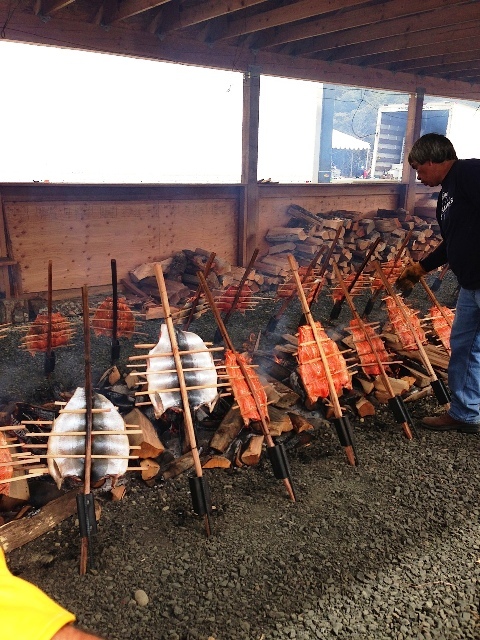 Meals featured traditional foods such as salmon, crab, venison, elk, and even buffalo. 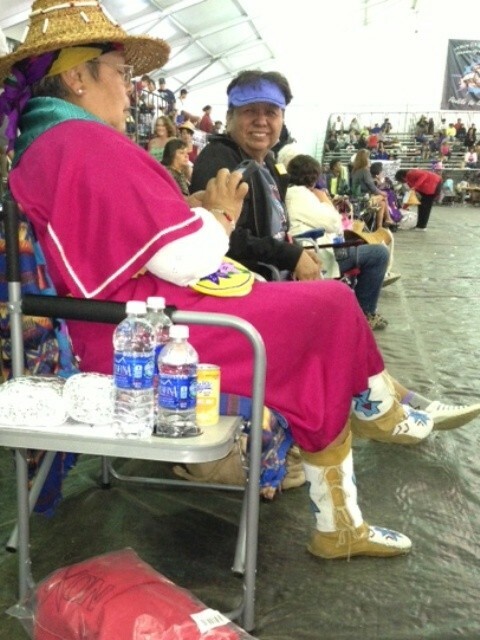 In the “Protocol Tent” each tribe had an opportunity to share its songs and dances as well as to talk about important recent events. These presentations began early in the morning and lasted for five days, all night in one case and on Wednesday we stayed to watch until 4:30 am and they still weren’t finished. 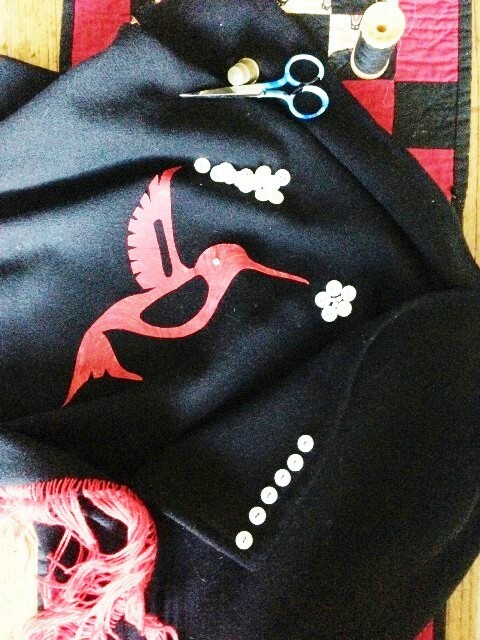 The regalia is often very elaborate, and many of the songs tell stories and use masks. There are three bands of Klallams, Port Gamble, Jamestown, and Lower Elwha. 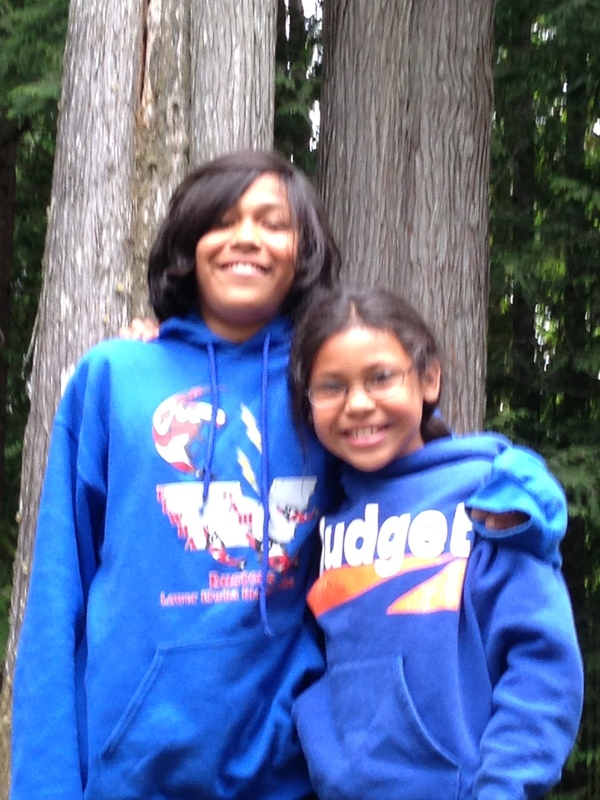 Our kids participate with the Lower Elwha and all together they made an impressive group. They sang and danced for over 4 hours. The theme of the event was “Honoring our Warriors” and all veterans were called to the floor and presented with specially made tee shirts. Other gifts were given as well, including the beaded necklaces we had helped to make. “Potlatch” is an important part of the ritual. Traditionally this was the giving of gifts by the host to all of the guests. Status was established by the value of gifts given and received. Most of the tribes shared gifts of small items, many of them made by tribal members, such as dried fruit, necklaces, beaded pins, calendars, CDs of their music and so forth. 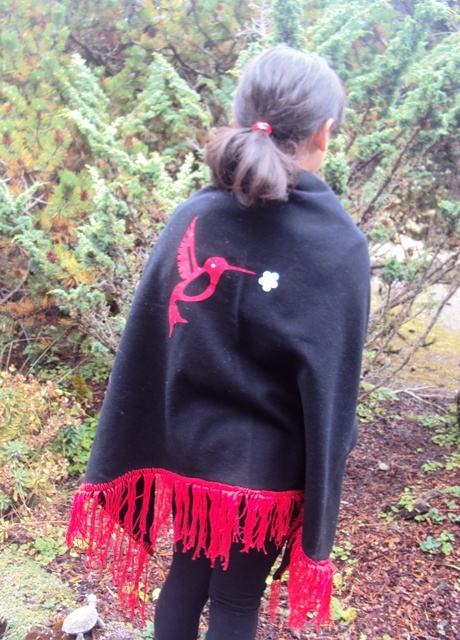 The practice of Potlatch was outlawed in 1884 by the federal government and that law was not repealed until 1951. 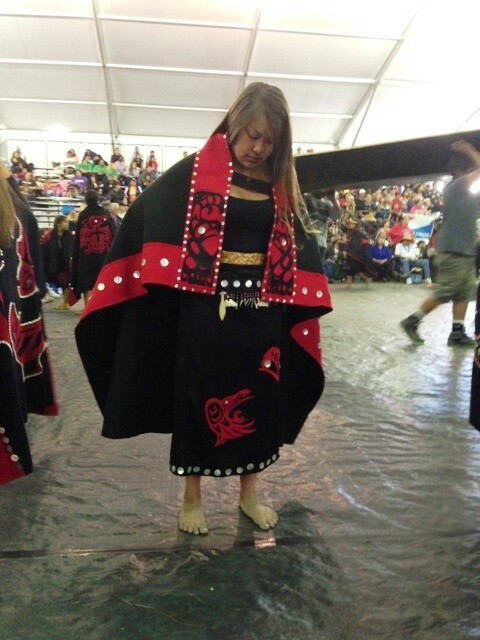 On the final day of the celebration the host tribe, the Quinaults, had the floor and interspersed with the performances of the dancers and singers, the giving of gifts took place. 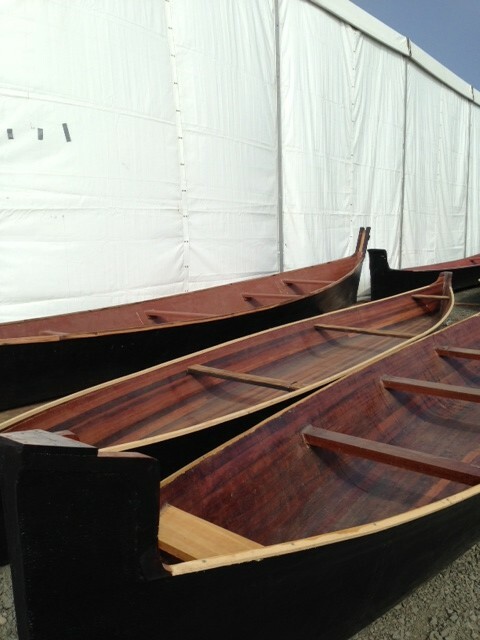 Ten traditional style canoes had been specially built and were given away to families outside of the tribe. 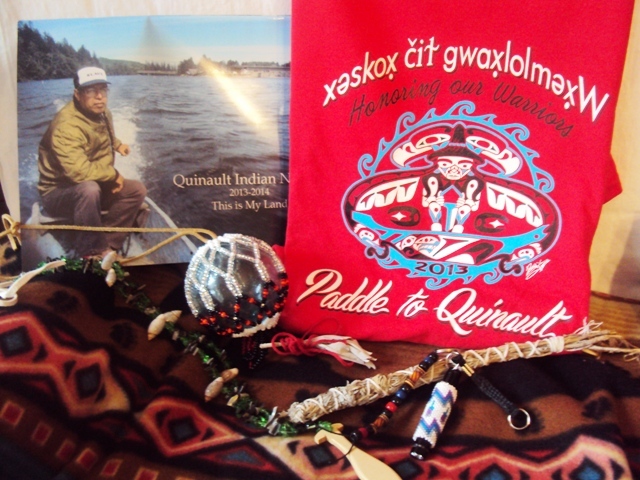 One was received by the family of the individual who organized the first “Tribal Journey” in 1989. 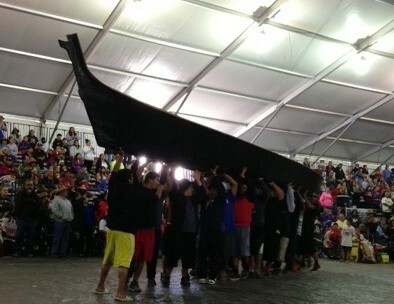 Each canoe was carried into tent to be presented. 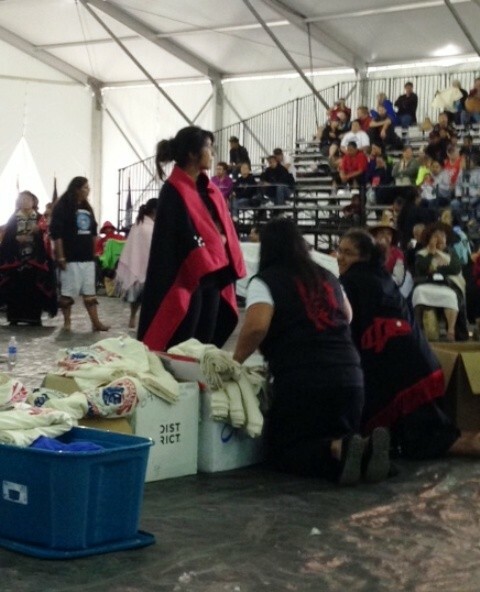 Tribal leaders were then called forward and each was wrapped in and given a specially made Pendleton blanket. Veterans were given blankets and the giving of smaller gifts to each person in the tent went on for hours. Seeing these traditional activates being revived and practiced today, after being nearly wiped out, was a moving experience. There is much to admire about what is happening. The languages are being taught again, and crafts such as basket weaving, totem carving and canoe making have been revived. It is also significant that this event, with thousands of people attending, is alcohol and drug free, and it spans the generations. One of my favorite things about the culture is their respect for the elders and their wisdom. 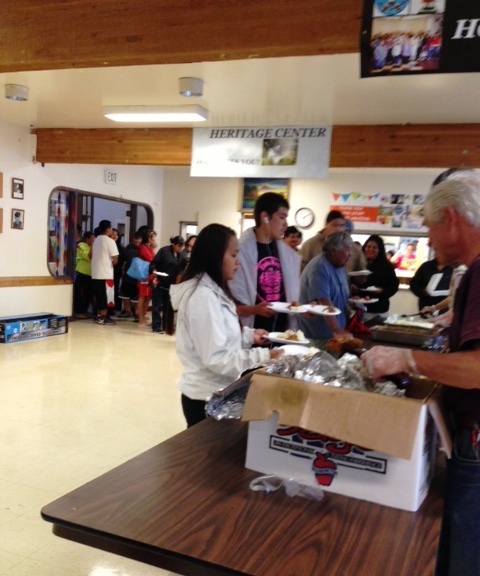 Even as non-Natives Ted and I were always sent to the front of the line to get our food before the young folks. Elders always board the bus first and the best seats in the tents are saved for them. Next year the destination will be Bella Bella on Vancouver Island. We are already talking about attending. 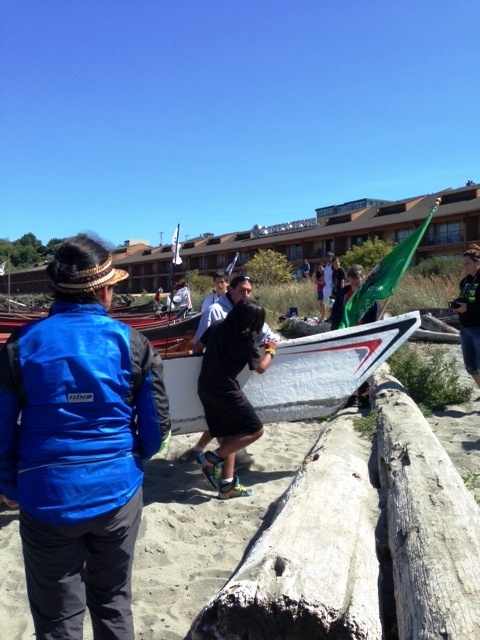 In 1989 the first reunion of canoe tribes of the Northwest was held in Seattle with about 10 canoes participating. Gatherings have been held each year since, with various tribes hosting. The numbers of tribes represented has increased and now they come from California, Alaska, Hawaii, and New Zealand, and a large number from Canada. 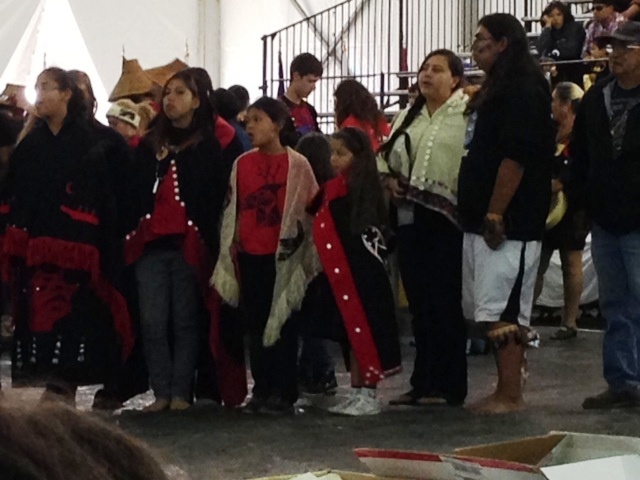 This year the gathering was hosted by the Quileute Tribe. 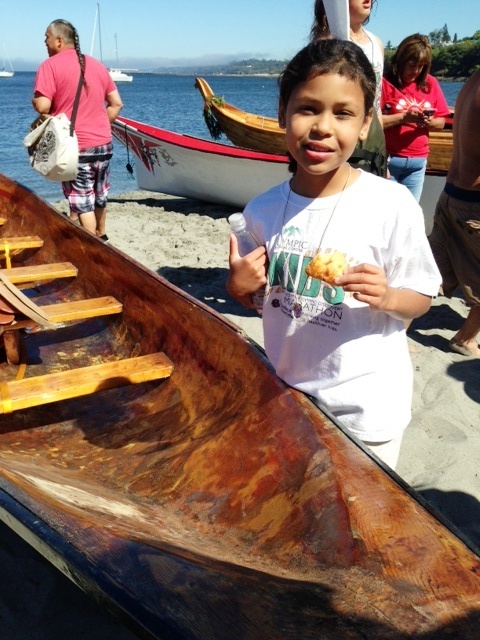 Over 100 canoes participated, and 15,000 people were expected to attend. 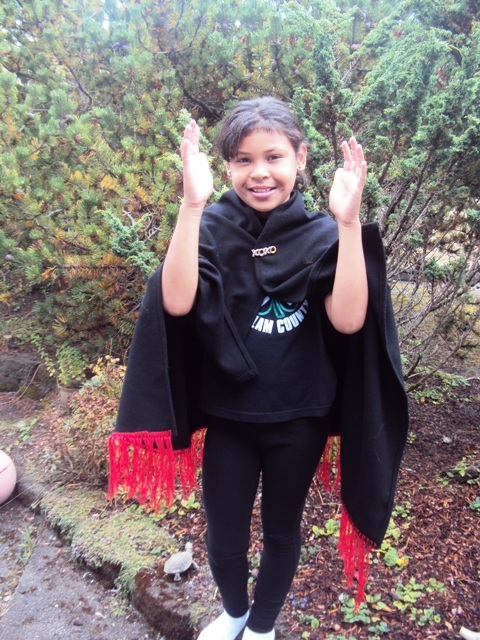 Seneca and Raven have been meeting twice a month with the local Elwha Tribe to prepare to perform traditional songs and dances which are accompanied by drumming. 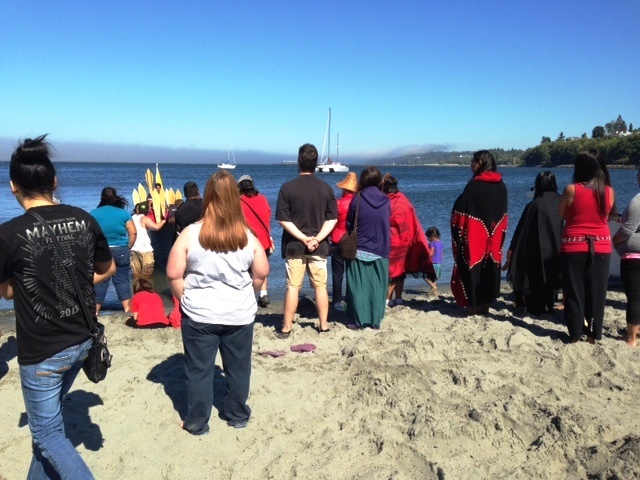 Our first actual contact for this year’s event took place here in Port Angeles when canoes from Puget Sound and Vancouver Island landed to rest for two days on their journey to Quinault. We were on the beach as the canoes arrived and each was welcomed with a song and the ceremony requesting permission to land took place. 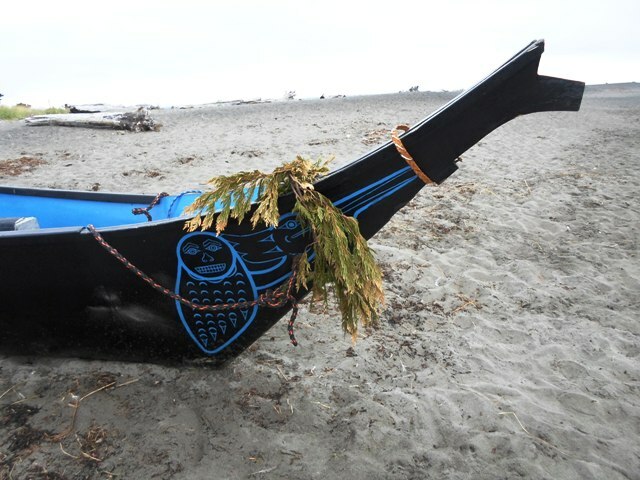 It took many hours for all of the canoes to arrive and for paddlers to be transported to the Lower Elwha Klallam Tribe’s reservation for dinner and to camp for two nights. Our family volunteered to help with dinner. 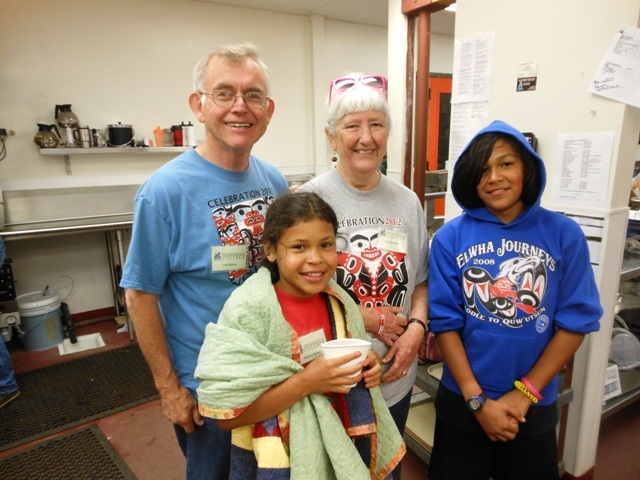 We served about 1500 meals that night. 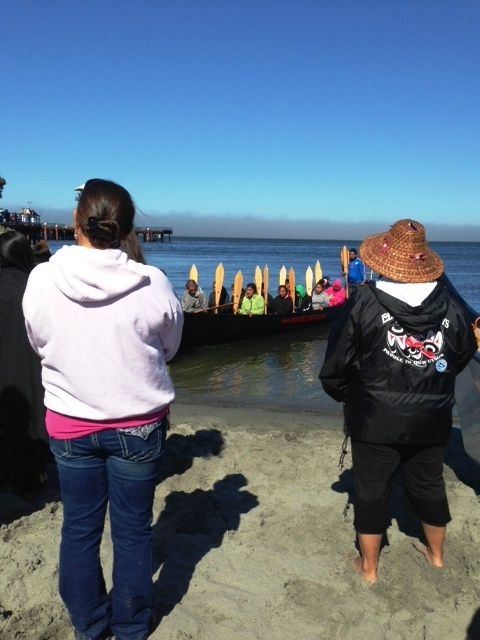 It will take several more days for the canoes to travel to Quinault, which is on the coast south of Forks. On the way they will stop at the reservations of the Makah, Quileute and Hoh Nations. We plan to meet them in Quinault, where 15,000 people are expected to gather.